R Galán Arribas, FJ Herrero Gutiérrez, M Vergara Fragoso, CA Martínez Arcos (2018): “Radio podcasting: Studies on radio podcasting: A systematic literature review in WOS and Scopus that reveals a low scientific production”. Revista Latina de Comunicación Social, 73, pp. 1398 to 1411. Introduction. In the media environment, on-demand content is becoming more and more prevalent. Radio is also evolving and is increasingly offering this type of content. However, radio has not been sufficiently appreciated as a medium and this has resulted in a low scientific production. Within this new model of radio convergence, this article aims to review the state of the scientific literature linking radio and podcast. Methods. The article presents an exhaustive review of the literature on podcasting and online radio, based on the review of the most cited journals listed in Scopus and WOS (Web of Science). Based on the systematic literature review technique, we formulated hypotheses related to the number of published articles, journals and countries of publication, language of articles, authors’ affiliation and impact factor. Results. There is a low incidence as far as production is concerned. An initial search revealed 91 articles, of which only 28 became part of the sample based on their subject. Almost all of the articles are written in English and are produced in English-Speaking countries, and Radio Journal is the publication that offers the largest number of articles on the subject under study. Radio, podcast, systematic literature review, bibliography. 1. Introduction. 2. Theoretical framework. 3. Objectives and hypotheses. 4. Methods. 4.1. Sample selection criteria. 5. Results. 6. Discussion of results. 7. Conclusions. 8. References. 9. Annex 1. In traditional radio, outdated structures still coexist with the new forms of information distribution and one of the big problems is this coexistence, where the old still lingers and the new has not fully arrived. If there is no full renovation, there will be no complete evolution or development. Despite this scenario, the radio sector has been immersed into a process of change that affects its entire value chain. Podcasting started this process of transformation and became a precursor of on-demand radio, which opened up new business models for the industry although with similar objectives (García-Gil, Gómez-García and Reguero-Sanz, 2018). Rapid data transmission, enabled by increased bandwidth, and the introduction of 5G technology expected for 2020 as well as the connection of mobile devices will give a new impetus to the definitive inclusion of online radio and the abandonment of waves-based radio broadcasting. This study presents the results of a Systematic Literature Review (SLR): “A systematic review requires locating, analysing, ordering, counting and evaluating literature from previously defined sources over a period of time” (Cárdenas-Solano, Martínez-Ardila and Becerra-Ardila, 2016, p. 932). The objective of this SLR is to provide an exhaustive examination of the literature available in the Scopus and Web of Science (WOS) databases. The existing literature is analysed based on the idea that research studies on radio and new technologies are very scarce. The purpose of this work is to obtain information on current guidelines and future challenges for the radio industry. Finally, this work will allow us to identify the most important authors and journals in radio research, which will provide a starting point about the state of the art for future research works. The “Global Village” is a concept based on the conception of a world without barriers, where the sociocultural consequences of communication have been gradually growing, and where everything is transmitted in a matter of seconds. In the 21st century, the mass media have played a key role in society and have become global empires with no national boundaries. The mass media and technology have also favoured new fields of research, but radio seems to have been excluded and neglected. It is the least researched and slowest-evolving mass medium, as many researchers have pointed out (Rodero, 2009; Faus, 2006; Erausquin, 1995; Checa, 2003). In short, literature on radio is very scarce despite it is considered the most credible medium (Herrero, 2009). It is the medium that receives the lowest volume of resources and the least institutional and educational attention. The situation is different for cinema or television, as there are many research works on their persuasive power and influence on the social behaviour. This is neither the case of the press, on which there is also abundant scientific literature, on the news framing, for example. Radio has always managed to adapt to change but it still has much to evolve. As Checa (2003) affirms, today’s radio has to be renewed and its social, cultural and educational role has to be reaffirmed. Radio generates a very low volume of scientific literature and it seems that the interest it generates among researchers is also minimal. Funding for research projects on radio is hard to get, especially if researchers fail to prove that the study has a social, cultural, political or psychological impact, that is to say, an impact on other branches of knowledge. Rodero (2009) considers that radio, as a medium with a distinctive identity, does not seem to count much. Due to this little recognition and the lack of funding, radio researchers carry out their works on their own in what is called grey literature. This makes it difficult to disseminate these studies, which do not make the appropriate impact in journals specialising in radio-related subjects, and are only delivered in general conferences as there are no conferences specialised in radio. Fortunately, many of the manuals that are published on this medium are the result of doctoral theses, which contribute to the dissemination of knowledge on radio. In spite of all this, Internet radio, which is the focus of this study, has made a space for itself in the interactive communication model, which is characterised by the tendency to programme fragmentation, new specific and thematic genres and programming, together with different distribution channels like social networks. Thanks to this, radio continues to claim its importance. Finally, reception and dissemination models have changed substantially and are determined by the use of the Internet and the increase in data rates and the speeds of fibre optic and 4G technology. Podcasting improves distribution and transforms the exploitation of audio and the relationship with listeners through the incorporation of new forms of radio dissemination and reception. With the resulting technological developments, it is evident that the sector is changing but must evolve even more to meet the new communication challenges, as it has already done before. Radio cannot be oblivious to innovation and needs to face its future like the rest of the cultural industries, by making an effective digital migration. Its ability to adapt will determine its survival (Franquet, 2008; Hurtado, 2007; Zallo, 2012; Rodero 2009; Gallego, 2010). Radio language and new technologies open up new expectations, as Tenorio (2012) points out in his work titled “The new Radio: Complete Manual for the Radio Communicator 2.0”. The author presents very relevant ideas and argues that online radio is still in its infancy and that the radio industry is the most resistant to evolve. He also claims that radio must be updated without delay, by adapting itself to the new consumption habits of users, understanding them and meeting their expectations, so that the new generations of listeners are incorporated to radio consumption. Gallego (2010) indicates that podcasting makes people understand radio differently. For example, it opens up new challenges for the sector from the point of view of technology, consumption and business and market dynamics, among others. This method of distribution frames radio in the 21st century context. Radio, therefore, should be framed in the field of culture and, as Zallo (2012) argues, this term can be a way of life and can serve to shape identities, but also a tool to manage social change. The radio sector is a cultural industry and must be part of the connection of people, and smart cities, communities and countries. National cultural policies must be generous in investments and face the digital change of the radio industry. This would end with the coexistence of analogue and digital radio, which like other mass media has already migrated to more advanced technological systems. In addition, and to promote immobility and continuism, radio needs a critical mass (which could be the young audience) of listeners to stimulate migration, while radio professionals, professors and researchers must also push from their positions the exodus to a fully digital scenario. This process of digitalisation involves a scenario of technological convergence of both public and private radio to face changes in their entire value chain. In short, as Franquet (2008) points out, the radio industry needs to reach an agreement with all the actors involved to be able to develop a plan of action to make the definitive jump to the digital convergence through the use of Information and Communication technologies (ICT), which guarantee plurality and consumption through all possible multimedia forms. Having highlighted the current situation, radio research during the 21st century does not seem to have increased in comparison to previous decades. This is the motivation behind this study, which aims to test the previous hypothesis. The main objective of this article is to review the existing literature on radio and new technologies in the Web of Science and Scopus databases. The study is based on the premise that radio studies are not very abundant, particularly those about 21st century radio. This study will allow us to get an idea of the production of high-impact articles to build have a point of departure and reference for future works. H1: There is a small number of articles (less than 50) that relate radio and new technologies. 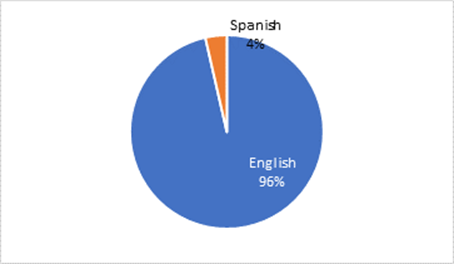 H2: The number of articles written in Spanish on the subject under study is negligible (less than 10). H3: Most articles are published in American journals. H4: There is no concentration of published articles in a single journal. H5: Most published articles are written only in English. H7: The number of published articles increases the closer we get to the present day. H8: Published articles do not made a big impact yet. Systematic Literature Review (hence SLR) was born in the field of medicine, based on the systematic review of research related to disease prevention and health treatments. However, this method is not limited to this field. Recently, it has become very common to use the SLR method to justify and frame studies in other areas of knowledge (Codina, 2015). Moreover, SLR synthesises the results of other research by using strategies to avoid biases. These tactics are fundamentally based on the search for high-impact articles, with clear and reproducible criteria. Likewise, SLR is especially useful in quantitative research works, to produce meta-analyses and provide a panoramic view of the object of study. SLR can be defined as a study in itself: a study in which the researcher defines an object of study, collects data from the selected articles, analyses them and reaches a conclusion. Authors such as Grant and Booth, (2009) define SLR as a secondary form of study with a defined method to identify, analyse and interpret evidence related to a research question. It is impartial and to some extent repeatable. Therefore, SLR collects and analyses various studies and research works through a systematic process in order to interpret the work of professionals in a given field. It provides a rigorous summary of the literature that in turn answers a specific research question. Thus, there is a need to carry out an exhaustive search for studies with impact on a particular topic, in order to obtain relevant results. With regards to the research question in a SLR, it should be clear and focused on a specific problem, while in ordinary bibliographic review the question is generic and unstructured. Secondly, the search for bibliography should be systematic and explicit. Thus, we can only include only those articles that meet our selection criteria. In third place, SLR assesses the quality of the selected works based on the methodological quality of the studies referenced by a statistical index. Finally, the interpretation of data must be based on evidence and not on personal opinions. Some authors define literature-mapping techniques such as “Brainstorming”,usingphrases or words related to the subject of study, or summarising the key concepts of books, journals and documents to create a conceptual map. Therefore, literature-mapping techniques would be complementary to SLR. One of the advantages of SLR is that it decreases the risk of bias and produces consistent results, while one of its disadvantages is that it requires a lot more effort than classical literature review. Authors like Codina (2015) indicate that the systematic concept means that it is not arbitrary or biased and that it has used the best sources. SLR must also explicitly disclose its sources and be reproducible so that other researchers can contrast the results. Does the article belong to the topic addressed? Is it published in Spanish? In order to carry out this study, we carried out a search in the Web of Science and Scopus databases. The filter used was the search for the terms “Radio” and “podcast” in the article’s title, abstract and keywords (Scopus) and the article’s title and subject (WOS). Once these filters were used, the entire population was analysed (population = sample). The total number of articles found after searching for the keywords [“Radio” AND “podcast”] is 91. Of those 91 articles, just 28 (see annex 1), 30.8% (Figure 1), belong to our selected topic (Radio and podcasting). Figure 1: Thematic relevance of articles found. Of the 28 articles that are part of the sample, 27 are written in English, and only 1 in Spanish (Figure 2). As for the country of publication, the largest number of articles were produced in English-speaking countries: the United States of America is the country in which more articles have been published on the subject (9), followed by Australia (8) and the United Kingdom (7). Four countries only produced one article: Spain, Turkey, Japan and the Netherlands (Figure 3). Figure 3. 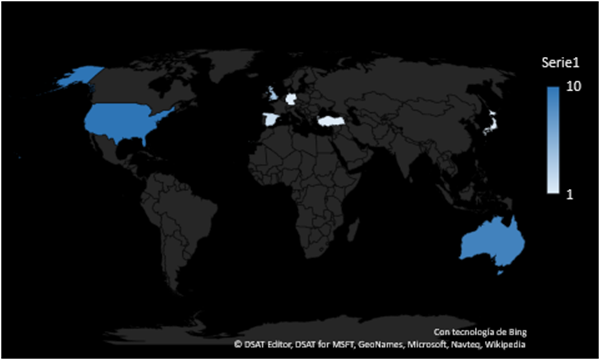 Geographic mapping of the articles according to country of publication. With regards to the origin of articles, according to the first author, the largest number comes from the USA (10), followed by Australia (9), the United Kingdom (4), Spain (2), Germany (1), Turkey (1) and Japan (1) (Figure 4). Figure 4. Geographic mapping of articles according to first author. The results refuted hypothesis 7 and require a new proposal for future research, based on year-by-year study, not by periods of several years. Finally, with regards to their impact, the articles do not have a great impact factor, in terms of number of citations received (Figure 5). In relation to the objectives of this study, and based on the analysis of the research work included in the SLR, we can conclude that the scientific production generated by radio is scarce and has a low impact factor, as proposed in hypotheses 1 and 8. In her review of bibliographic and hemerographic production on radio in Spain, Rodero (2009) highlights the low scientific production that is generated about radio in Spain and the few resources, staff and attention that are dedicated to it. The author claims that radio is a poor medium and that although it has its own identity it does not seem to count much. Although the author ends her article recognising the effort of radio researchers, she remarks that they still need to continue working to get people to recognise the role, importance and influence of radio as a mass medium. For his part, Gallego (2012), in his article titled “Podcasting in Spain: ¿a new business model or a reflection of traditional radio?”, says that the concept of on-demand radio evolves with each Innovation, like subscription and mobility, which allow users to follow new programmes without having to worry about schedules. The author also highlights the uncertainty of this technology to generate benefits, which worries businessmen, researchers and Internet service providers. Gallego also encourages us to give relevance to the podcast and differentiate it from radio broadcasting to attract advertisers. Therefore, it can be said that podcasting opens up a new interactive communication model and a new business model yet to be explored. It is a concept that agitates the sector, showing a different landscape that revolutionises the entire value chain. These patterns will determine new consumption habits; the incorporation of a proactive consumer implies that they decide what they want to hear, and when and how they want it. Finally, Pluskota (2016) points out that radio is going through a critical time in terms of the type of listener that is emerging and that its future as a mass medium is on the air. The Baby Boomer generation is evaporating and will be replaced by Millennials and later the Z-generation. Radio should reconsider its place and strive to be competitive in a technological space. It also needs to adapt its model to a truly competitive model and must be strategically redefined as an industry. Along with the new technologies, radio must show its strength as a mass medium that contributes to the development and consolidation of democratic states. H1 proposed that there is a small number of articles (less than 50) that relate radio and new technologies. The hypothesis is confirmed because, although a total of 91 articles contained both terms, only 28 articles addressed the specific topics. These data confirm that the index of publications in Scopus and WOS is very low and that the related scientific literature is little significant. 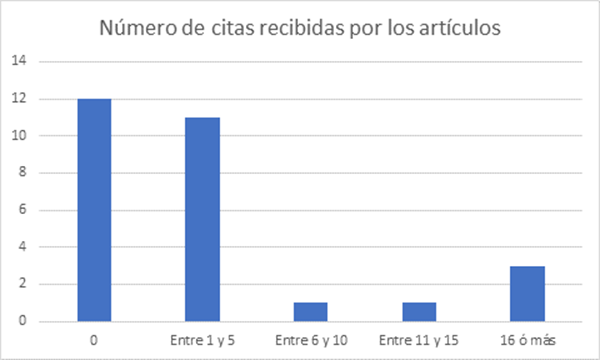 H2, which indicated that the number of articles written on the subject in Spanish is negligible (less than 10), is accepted since of all the articles accepted for the SLR only one was written in Spanish: one dealing with podcasting as a business model in Spain. It should be noted that the remaining 27 articles are written in English. H3 and H4, which proposed, respectively, that “most articles are published in American journals” and that “there is no concentration of articles in a single journal”, are also accepted. The USA published the largest number of articles but there was no concentration of articles, although Radio Journal published five articles. H5, which pointed out that most articles were published only in English, is also accepted, as most articles come from the USA, followed by Australia and the United Kingdom. H7, which contends that the number of published articles increases as we get closer the present day”, is rejected, although perhaps the proposed hypothesis should be reconsidered in this regard. Finally, H8, which proposed that the published articles do not have a high impact factor yet, is accepted, as there are only two articles with a high number of citations: 1) Reducing the Effects of Isolation and Promoting Inclusivity for Distance Learners through Podcasting”, which has received 74 citations and addresses the podcast as a learning tool in a group of students; and 2) “Will the iPod kill the radio star? : Profiling podcasting as radio”, which has received 59 citations and addresses the increase in podcast consumption as a result of the emergence of the iPod. The rest of the articles have received less than five citations. In short, the results of this study show that there is very few research works on radio as such. Although there is a specialised journal of great impact on radio studies, publications of this type are few, especially in comparison with journals specialised in other fields of the broad spectrum of media and communication. Finally, we must say that the USA, together with Australia and the United Kingdom, seem to be the pioneers in these studies. Our expectation is that in the next few years, with the advent of technologies such as 5G, these countries will contribute to the development of the so-called Internet of Things (IoT), and will take the sector to a higher level. Checa, A. (2004). Fuentes sobre radio. Un siglo de bibliografía internacional. España: Mergablum. Edición y Comunicación. ISBN: 9788495118936. Faus, Á. (2007). La radio en España (1896-1977): Una historia documental. Madrid: Taurus. ISBN: 9788430606504. E., Franquet, R., García-Leyva, M. T, López, X. y Pereira, X. Alternativa en los medios de comunicación digitales. Barcelona: Gedisa Editorial y Fundación Alternativas. Gallego, J. (2010). Podcasting. Nuevos modelos de distribución para los contenidos sonoros. Barcelona: Editorial UOC. ISBN: 978-84-9788-857-8. Gallego, J. (2012). Podcasting in spain: A new business model or a reflection of traditional radio? Radio Journal: International Studies in Broadcast & Audio Media, 10(1), 23-34. Tenorio, I. (2012). La nueva radio: Manual completo del radiofonista 2.0. Barcelona: Marcombo. ISBN: 978-84-267-1772-6. Saying "I do" to podcasting another "next big thing" for librarians? Podcasting: Are student competencies hindering its potential? Podcasting in Spain: A new business model or a reflection of traditional radio? Thanks to the Department of Sociology and Communication of the University of Salamanca, for financing the translation of the article. Article received on 18 July 2018. Accepted on 21 October.